Right before MoCCA Art Fest 2011, comicbook artist and inker Peter Palmiotti (he’s worked for Marvel, DC, and many other publishing companies; both major as well as small press) sent me a message on Facebook. Think it was Facebook, or an email, can’t remember which. Anyhow, he had an idea for a quickie collaboration. Peter kindly asked if I could do a pencil sketch, in which he would then ink in. I agreed. 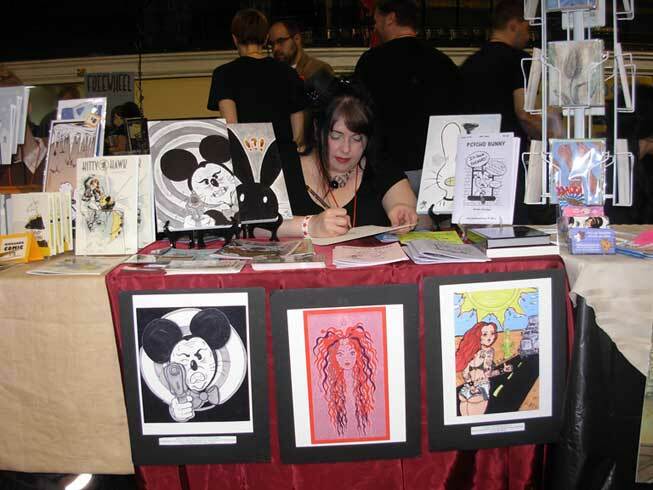 If you’ve read some of my earlier blog posts a few weeks back, (https://witchesbrewpress.wordpress.com/2011/04/11/mocca-art-fest-2011/) I did the pencil sketch right after I had spent 24-28 putting together a Psycho Bunny mini-issue. Despite major sleep deprivation, I was on a drawing roll. To quote myself, I was a mean, not-so-lean sketching machine. A few hours later, Peter drops by my table. We’ve been internet buddies for quite some time now. It was on his birthday that we finally met, even if it was only for a few minutes. Pencil sketch prior to inking. Done April 2011. Be sure to check out his other pieces too. So earlier this week I went to visit a long-time friend. I had originally met him sometime during the late 80s through a mutual friend, but hung out with him more during the mid-late 90s. Sometimes we used to go to Coney Island High together. Other times, we would just go bar hopping along the Lower East Side. This was way before NYC got bleached with gentrification. Back then, I did not give a toss about the next day; nevermind what would happen in the near future. Of course, the good times don’t last forever. Nothing in life lasts forever. All you can do is to move on into the present. Anyway…I hopped onto a bus at NYC’s Port Authority to Reading, PA. Not that it was an exotic vacation by any means. In fact, downtown Reading is pretty much a dump. It wasn’t until I checked on my iPhone to discover Reading’s ranking as the 5th crime-ridden small town in America. Yeck. Still, I had a good time. Went down a much needed walk down a nature trail. Along the way, me and the friend started talking about various music we grew up listening to. I’d be the first to admit, I much prefer to listen to music made 10-50 years ago as opposed to what’s being made now. Still, these conversations kinda sorta had me re-discovering stuff from long ago days. Like The Smiths for example. I was a big Smiths fan during my teen years. By the time 1993 rolled around however, I was so, so, so sick of them, and other such groups like The Cure. I’m still tired of The Cure. Unless its the very early stuff or Robert Smith’s side project The Glove, I never want to hear songs by The Cure ever again. Rediscovering The Smiths proved worthy. Just listening to a few of Morrissey and Johnny Marr’s handiwork…they kinda like a Lennon/McCarthy of the 1980s. While everyone else was listening to garbage like Micheal Jackson, The Smiths hit a raw nerve to the disfranchised, the lonely, the confused, the heartbroken, the loners, the daydreamers. When night came, we switched to early David Bowie. Ziggy Stardust, Aladdin Sane, Young Americans, and a bit of the Heroes era. There’s music made for for temporary mass consumption, and then there’s music for the long-term influential. Musical acts like The Smiths and early David Bowie fall into the long-term influential. The long-term influential isn’t just for other musicians. The tunes of the long-term influential also affects artists, writers, actors, directors, designers, travelers, mystics, and so on. Music and art go hand in hand, for imagination is the magician’s most crucial asset. On the way home back to NYC, I started to think about all the great bands from the 1980s and the ’90s. Today, I discovered this online article from the Flavorwire website: 10 Glaring Omissions from Rolling Stone’s Top Albums of the ’80s. I remember buying that particular Rolling Stone issue, either in 1989 or 1990. While it did mention Culture Club, Duran Duran, and Human League, I was disappointed with some of the other choices. Okay, The Clash was an important band way back when, but their album “London Calling” is in no way the best album of the 80s. No way. This is all subject to personal opinion. I say tomateoo, you say tomatoe. Personally, I like some of the albums that Flavorwire listed. Totally remembered purchasing “Psychocandy” by The Jesus and Mary Chain. I played that vinyl until all the grooves were scratched up. Enough of this opinionated musical memory lane. Time to head back to the present. Entrance For MoCCA Art Fest 2011. MoCCA came and went. Kinda glad its over in a way, although I still haven’t caught up on sleep. If I didn’t have school, I would have gladly stayed home. The MoCCA Art Fest itself didn’t tire me out. Actually, it was staying up all night working on the latest Psycho Bunny mini issue that did it. By the time I had arrived at the fest itself, I was pretty much zombified. At my table I practiced the art of sleeping with my eyes open. It was around this point that I swore never, ever again will I attempt to pump out a self published issue within a 24 hour period. These might be empty words though. Somehow I can see myself doing another 24 hour art marathon. Pencil sketch done morning of April 9th, 2011. To be inked by artist & podcaster Peter Palmiotti. At this point I had become a mean, not so lean drawing machine. Still amazed that I was able to sketch while suffering from sleep deprivation. The piece itself, done on illustration board with Dewitt brand pencils was for a collaboration between me and artist/writer/inker/podcaster Peter Palmiotti. He’s done stuff for Marvel, DC, Image, Valiant and numerous independent titles. When he asked me to collaborate on this, I considered it an honor. 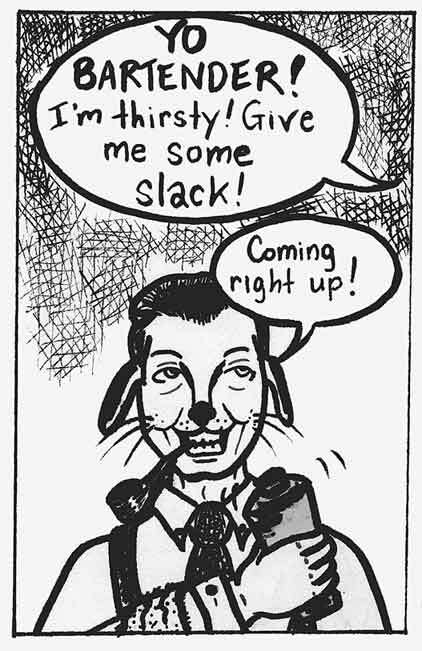 My own influences have always been more of the Fantagraphics Books style. What really got me into comics was the likes of Los Hernandez Brothers (Xamie and Gilbert) and Peter Bagge. I’ve been reading titles from these two parties since the early ’90s. Got dog-earred copies of their comics to prove this. 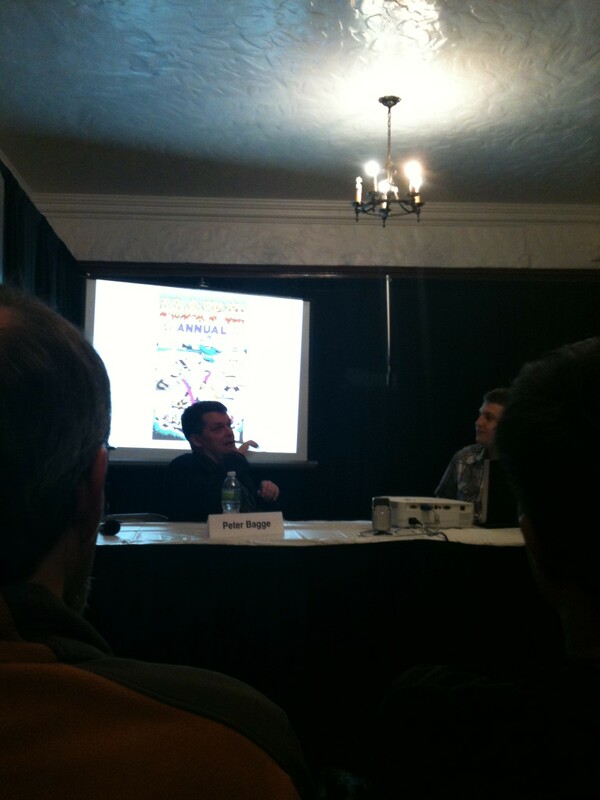 Peter Bagge panel at MoCCA Art Fest 2011. Yeah, I’m getting all sentimental here. Meeting both Hernandez Brothers last year, and Peter Bagge this year reminded me of why I dug comics in the first place. Also reminded me of why I put up with various nonsense over the past few years. Its due to my love of this medium. Honestly, if it wasn’t for these two, I would have never been a comicbook fan in the first place. When I was a child I read comics, mostly Harvey titles, Rupert The Bear, Archie, Peanuts, along with various newspaper strips. Yet it wasn’t until the late ’80s/early ’90s that I fell in love with what comics truly had to offer. After discovering those two, I explored different titles, like Sandman, Joe Matt’s Peepshow, Omaha The Cat Dancer, some Robert Crumb stuff, etc. In the end, I always went back to L&R and Hate. So if anything, you can always blame Hernandez Brothers and Peter Bagge. Back to MoCCA. It was a bit slower for me than it was last year, but still managed to sell some stuff. 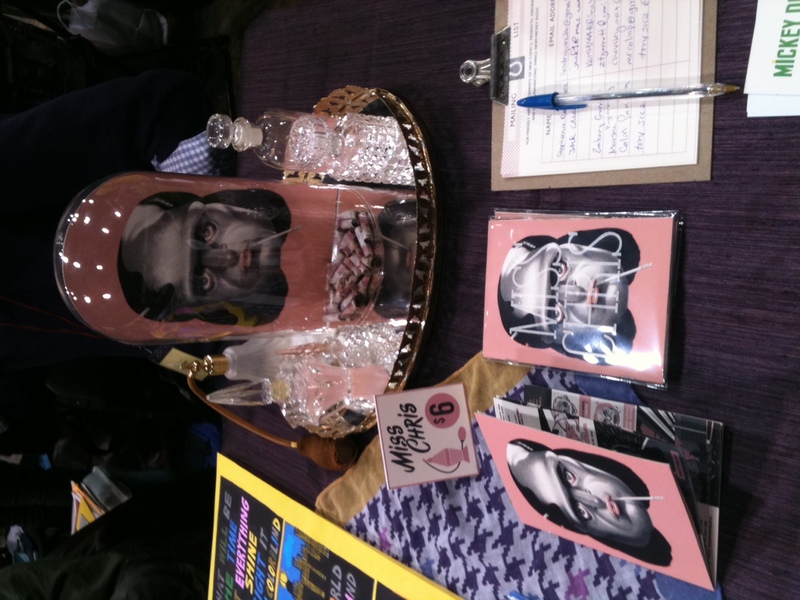 Miss Chris table display at MoCCA Art Fest 2011. 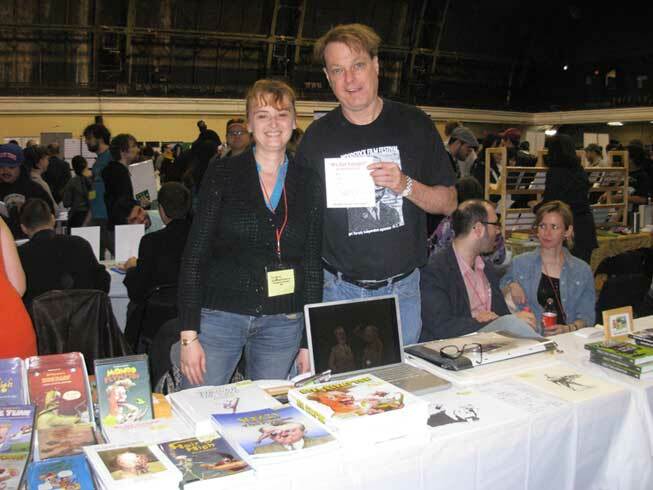 Animator Bill Bill Plympton and friend, MoCCA Art Fest 2011. This was the table to my left. The two female artists were Vanessa Taffuri & Amy Lynn Duengf. MoCCA Art Fest 2011. 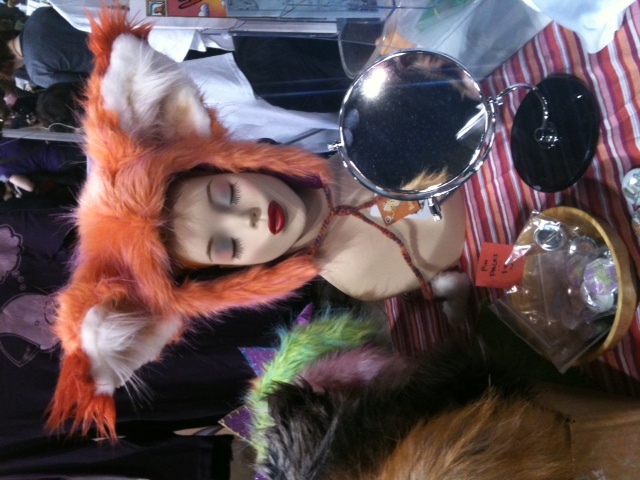 Fur hat for sale at MoCCA Art Fest 2011. 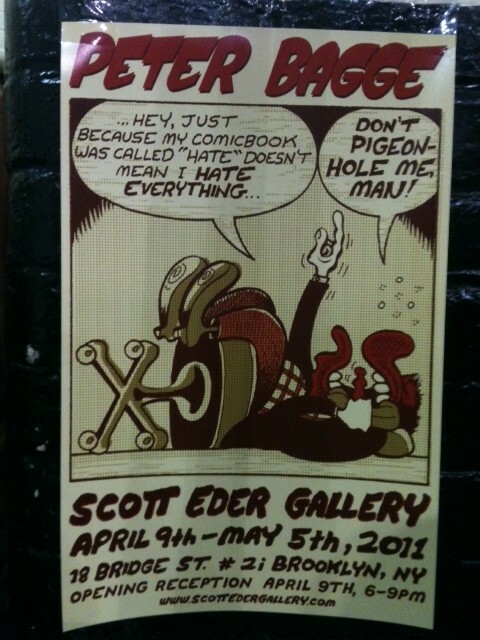 Here's a poster for the Peter Bagge exhibit being held at the Scott Elder gallery. Like a true fan dork, I took the poster. Not that I usually swipe stuff, but hey. Don't worry, I still have ethics; I waited until the weekend was nearly over before I took it. Still like MoCCA Art Fest better than some of the more mainstream comic cons. Probably because with the Alternative cons, its more mellow, and focuses more on the artists than numerous collector items. This past weekend saw the release of the Psycho Bunny mini-issue #3.25. It almost didn’t come out. Hence, I sacrificed sleep to make sure I would have the latest Psycho Bunny out in time for MoCCA Art Fest 2011. By 12am I was riding the subway to Manhattan. By 2am I was in some 24 hour copy/printing place near Times Square. By the time the first copy was made, it was 3am in the morning. By the time I arrived back home in Queens, it was 4am. Three hours sleep wasn’t nearly enough, for I had to set up at MoCCA before doors open, which was 11am. Is a God to live in a dog? Praise Bob! Not that anyone was lining up to purchase the latest copy of Psycho Bunny, but still…was it worth sleep deprivation? Absolutely! I’d like to think I adhere to deadlines, especially my own. 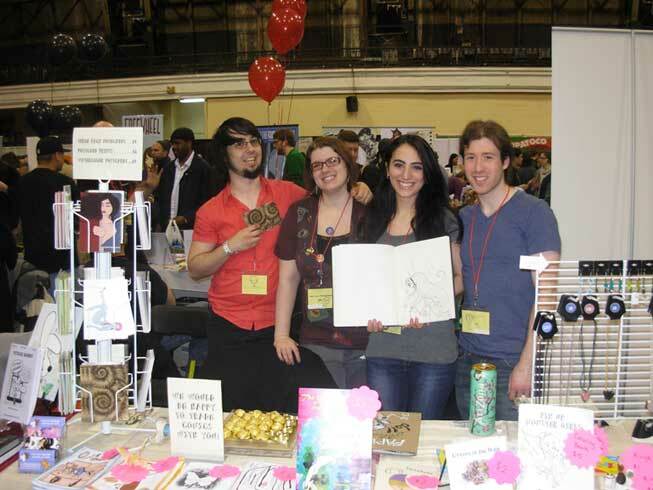 So even though I was kinda spaced out at MoCCA, it was totally worth it in order to present new material. Besides, in Chinese astrology, it’s currently in the year of the rabbit. Since I hadn’t done anything with Psycho Bunny since 2008, it was time for a new issue. 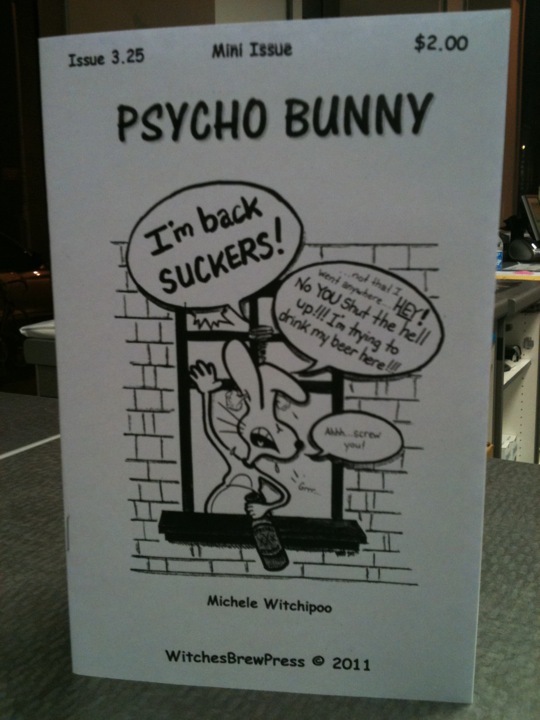 Psycho Bunny mini issue # 3.25 debuted at the MoCCA Art Fest 2011 this past weekend. You can also order your own copy by sending $2.00 plus $1.00 S&H via PayPal to PsychoBunnyComix@aol.com or Witchipoo@witchesbrewpress.net. More on MoCCA with the next post. Okay, this is the deal. I’m going to have a small table at the MoCCA Art Fest 2011. (This weekend, tomorrow & Sunday) Whether or not I will have the latest mini-issue of Psycho Bunny ready, remains to be seen. Regardless, come by my table, say hi, and buy some of my artwork! 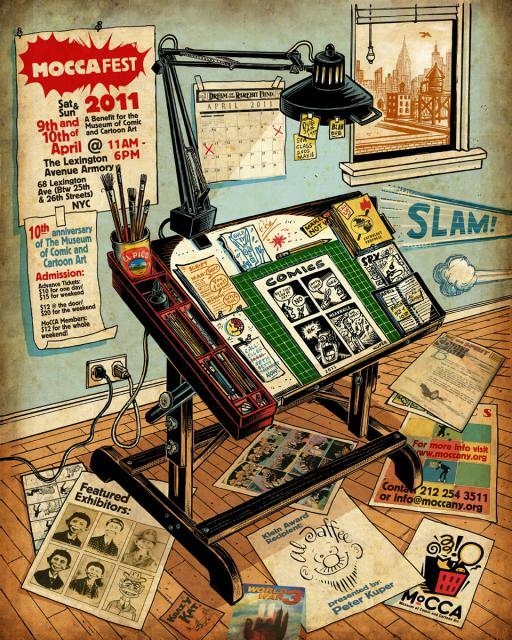 Poster For MoCCA Art Fest 2011. Artwork by Peter Kuper. 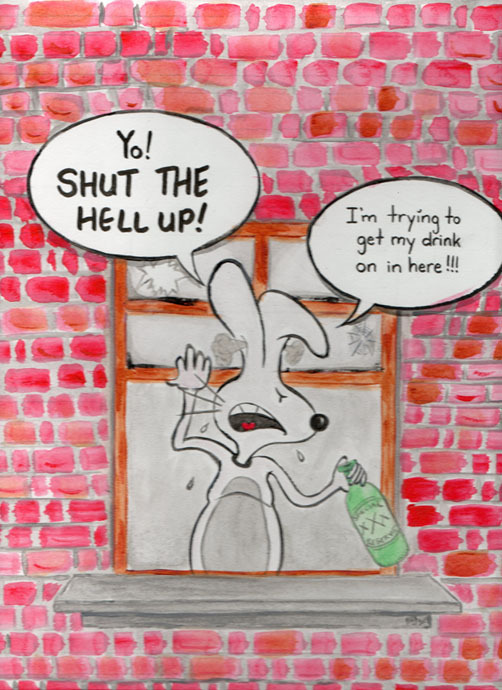 In Psycho Bunny issue three, I created a fake beer ad. Doing it again for Psycho Bunny mini-issue 3.25. 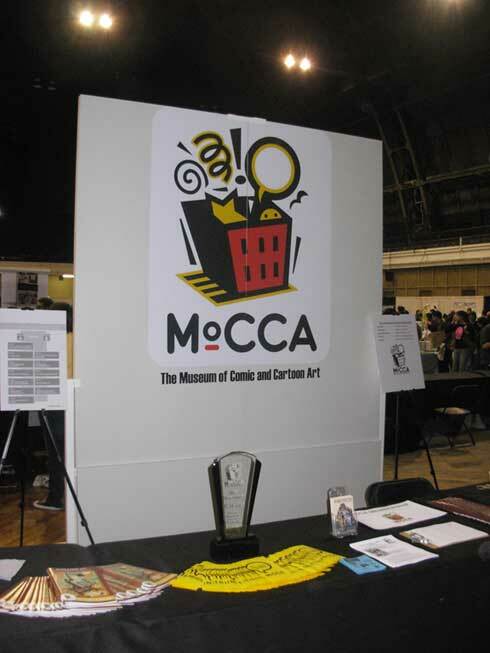 Remember, see you at MoCCA!